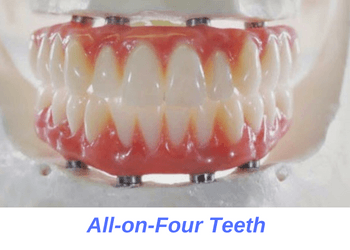 Is all-on-4 teeth the same as a denture? How do you make all-on-four teeth? Am I a candidate for all-on-4 treatment? What is the process for all-on-four treatment? 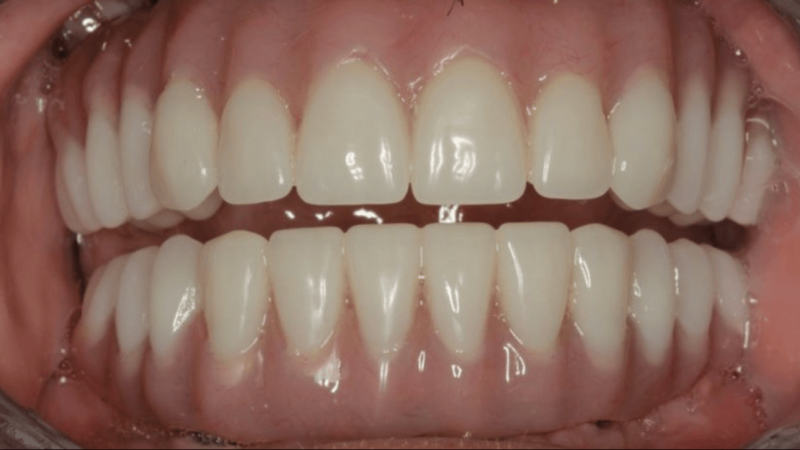 What is the cost for all-on-four teeth? All-on-4 dental implants in Orange County. 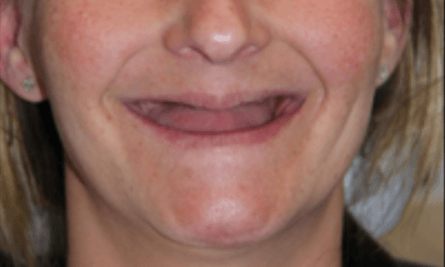 Patient with no teeth before treatment with all-on-four teeth. All-on-four teeth replaced every tooth, giving patient a permanent, beautiful smile. All-on-four dental implants (abbreviated AO4) is a set of fixed, non-removable set of teeth which anchor onto 4 or more dental implants. Each all-on-four teeth consists of an implant-retained porcelain or zirconia bridge which is permanently anchored onto for or more individual dental implants. With all-on-4 teeth you can replace every single tooth in your upper and/or lower jaw with permanent, fixed teeth. 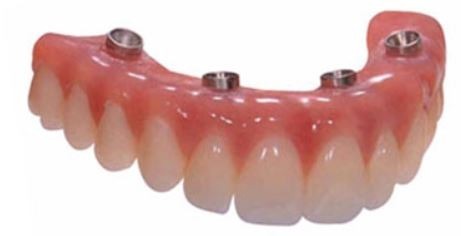 Is all-on-4 the same as a denture? As opposed to dentures, all-on-four teeth are fixed in your mouth. This means that you can not remove them from your mouth the same way you remove dentures. All-on-four teeth are made from high quality, natural looking porcelain or zirconia ceramic. All-on-four teeth are made from high quality, natural looking porcelain or zirconia ceramic. The bridge replaces all of your missing teeth and gum tissue within each arch and feels like your own natural teeth. These teeth are durable and natural looking and last you a lifetime. Denture teeth are typically made from acrylic and wear out after several years of use. Denture teeth are not very effective at chewing and most denture wearers avoid eating hard food objects. This is because dentures offer about 25 to 40% chewing efficiency of natural teeth. With all-on-4 teeth you will have nearly 100% chewing efficiency, which means you can finally eat that lobster and steak you’ve been dying to have! All-on-four teeth give you the added benefits that the implants help preserve your jaw bone. The bridge holds your facial muscles in place and prevents them from collapsing. Ultimately, all-on-four teeth make you look and feel much younger as compared to dentures. In addition to the benefits listed above, all-on-four teeth gives you more confidence. On the other hand, wearing dentures causes your jaw bone to shrink and allows your facial muscles to collapse. The process of receiving all-on-four teeth starts by placing a minimum of four dental implants. We place these implants in areas with the highest quality bone, typically the chin and nose region. This bypasses the need for extensive bone graft procedures. Once your implants have healed, we secure your permanent bridge on top. 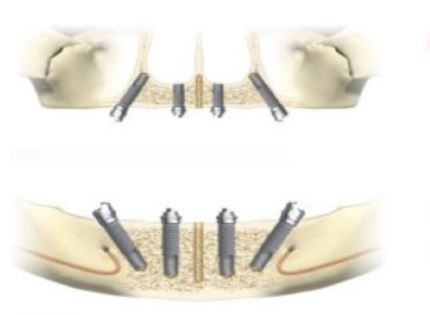 Your bridge is screwed onto the implants which permanently locks them in place. There are numerous benefits to going for all-on-4 teeth over traditional dentures. All-on-four teeth are fixed, permanent teeth. This means that your teeth stay in your mouth at all times as if they were your original teeth. The porcelain and zirconia teeth used for AO4 teeth provide for excellent chewing ability, speech and aesthetic. You can speak and eat as if you had your original teeth back again. Plus, getting dental implants helps preserve your valuable jawbone over time. Since dental implants absorb the bulk of your bite stress, this significantly reduces the stress applied to your jawbone. By preserving your jawbone, you will look younger and maintain a fuller, happier facial profile. When you get all-on-4 teeth, your dentist will remove all of your remaining natural teeth. No longer will you have to worry about developing annoying cavities, needing deep cleanings or developing dental infections. 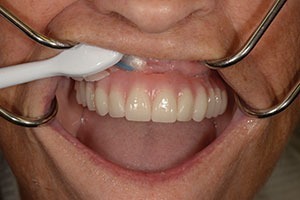 In fact, maintaining AO4 teeth is as easy as daily cleaning and an annual dental checkup for routine maintenance. All-on-four treatment has been simplified to make the whole process easy and straight forward. Treatment is relatively quick, usually taking just a few months. In fact, there are offices that are equipped to perform the entire treatment in 1 to 2 days for those who qualify. This is pretty quick when you compare AO4 treatment to full mouth dental implants which typically takes upwards of a year. By no means are all-on-4 teeth inexpensive. Priced at between 15 to 25 thousand dollars per arch, all-on-four treatment is a significant investment for almost all people. However, you must consider the fact that you’re getting the equivalent of twelve dental implants per arch with AO4 treatment. This is actually significantly less expensive than full mouth dental implants which is another way to receive fixed teeth. Additionally, the younger you are, the more investing in AO4 makes sense. Having to struggle with dentures and redoing them for 20 to 30 years can be very costly and time consuming as well. All-on-4 technology was developed to avoid extensive bone augmentation techniques. As opposed to full mouth dental implants, almost everyone is a candidate for all-on-4 teeth. This is because the all-on-4 technology was developed to avoid extensive bone augmentation techniques. During AO4 treatment, we place your dental implants in the anterior chin and palate area. These areas have the highest quality bone and are almost always a good candidate for dental implant placement. As a result, most people qualify for AO4 treatment without the need for extensive bone graft or augmentation surgeries. Most all-on-four cases are performed with 4 dental implants, although occasionally a 5th and 6th implant is added. Your implants are all placed at the same time during a single visit. Additionally, if there are broken teeth, loose teeth or sharp bony edges, these are all addressed during your surgery. Afterwards, you have to wait about 3 to 4 months for the implants to integrate with your bone before receiving your teeth. 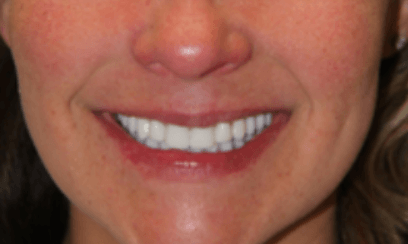 Making a beautiful set of teeth on top of a few implants is a step-by-step process. This usually takes several visits, although some offices have a lab that offers same day teeth. Your dentist will verify during this process that your bite is correct and that you like your new teeth. 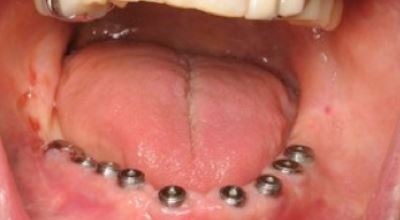 Once your all-on-4 bridge is completed, your teeth are screwed onto the implants and remain in your mouth permanently. In fact, wearing all-on-4 teeth is nearly the same as having your original natural teeth back! Most all-on-four teeth can be performed without the need for any major bone graft procedures. On the other hand, most full mouth dental implants require extensive bone augmentation treatment. This includes sinus grafting, block grafts and tissue grafts to buildup the bone and gum tissue. These procedures add significantly to your costs as they are all very expensive procedures. Full mouth implants require an average of 8 to 10 implant posts per arch. The all-on-four technique is developed to only require 4 dental implant posts for majority of cases. On the other hand, full mouth implants require an average of 8 to 10 implant posts per arch. Of course, more implant posts also means more expenses which is why full mouth dental implants typically cost double that of all-on-4 teeth. Typically, all-on-four treatment is completed in weeks or months whereas full mouth dental implants typically takes a year or longer to complete. Full mouth dental implants requires one healing period for the bone graft surgery, which usually takes 6 months on average. Additionally, making individual crowns and bridges is very technically demanding and takes much longer than fabricating an all-on-four procelain bridge. These factors all add up, accounting for why full mouth implants cost so much more than all-on-four implant teeth. During your consultation we present all of your treatment options and discuss alternative treatments.